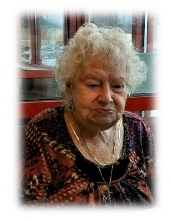 Mildred Carlson, age 95 of Williamsburg, Ky., passed away Wednesday June 20, 2018 at her home. She was born April 4, 1923 in Whitley County, Ky. to the late Claude and Vicy Moses Heatwole. Along with her parents she was preceded in death by her husband Ernest Carlson, several brothers and sisters. She is survived by 3 daughters; Carla Johnson, Elana Carlson and Gail Collette all of Williamsburg, Ky., 4 sons; Robert Carlson of Gray, Ky., Larry Carlson of Middleburg, Florida, Ernie Carlson of Huntsville, Alabama and Carl Carlson of Lexington, Ky., 26 grandchildren, many great grandchildren and several great great grandchildren, 2 sisters; Ruth McCullah of Williamsburg, Ky., Claudia Christine Count of Florida, several nieces, nephews and a host of relatives and friends to mourn her passing. Funeral service will be 1:00 pm Monday June 25, 2018 at Ellison Funeral Home Chapel with Rev. Joe Caddell officiating. Interment will be in the Cumberland Freewill Cemetery. Visitation will be 11:00 am until funeral hour Monday June 25, 2018 at the funeral home. To send flowers or a remembrance gift to the family of Mildred Carlson, please visit our Tribute Store. "Email Address" would like to share the life celebration of Mildred Carlson. Click on the "link" to go to share a favorite memory or leave a condolence message for the family.